It has been a while since I've posted an update about the books my girls, the Read-at-Home Kids, are enjoying. As I've mentioned in a few of my Read-at-Home Mom report posts, my dad passed away in the middle of our move, and because of that, it took us a little while to get settled. 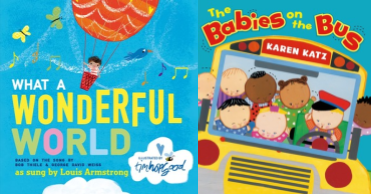 We're finally getting into a good routine now, and we've started homeschooling kindergarten with our oldest, so it seems like a good time to share our latest reads. Little Miss Muffet (4 years, 10 months) is my kindergartner, and she has been going through chapter books like crazy. She read straight through the first three Betsy-Tacy books, Betsy-Tacy, Betsy, Tacy and Tib, and Betsy and Tacy Go Over the Big Hill, and I decided to stop her before she read the fourth book, since I think that's where the subject matter starts to be appealing to a bit of an older audience. I explained that Betsy gets older in each book and that she should catch up to Betsy a little bit before she reads more. She also continues to be interested in The Boxcar Children series, and she often comes to the dinner table bursting to share the latest clues the Alden children have uncovered. She has finished the first seven titles of the series, and she has free access to all the original books written by Gertrude Chandler Warner. We also recently finished listening to the audiobook of Farmer Boy. We originally started it on one our trips to New York this summer, but kept repeating certain chapters, so it took us a while to actually complete the story. Miss Muffet loved it, and she speaks fondly of Almanzo all the time. The next few Little House books seem like they could wait until she is a little older, too, so in the meantime we have introduced one of the spin-off series. She has just started reading Little House in the Highlands by Melissa Wiley, which is book 1 in the series about Laura Ingalls Wilder's great-grandmother Martha. After two chapters, Miss Muffet has announced that this book deserves 100 stars. In addition to all this independent reading, Miss Muffet has also been enjoying a lot of nonfiction read-alouds with me during her school day. We just finished Can't You Make them Behave, King George? by Jean Fritz, which appealed to two of her main interests: the royal family and the American Revolution. Some days, we took turns reading a few pages, other days I just read to her, and we talked about it a little bit afterwards. She seems to really love biographies, so my plan is to alternate between history lessons based on My Backyard History Book and read-alouds of a similar level and format to this book. We've also been studying a bit of art history using How to Use Child-size Masterpieces for Art Appreciation, and she took such a liking to the Mona Lisa, that I went on Open Library and found Katie and the Mona Lisa by James Mayhew. She was disappointed that Mayhew's illustrations aren't of da Vinci quality, but otherwise, she enjoyed this more whimsical look at the painting. As we've started studying solids, liquids, and gases in science, we've read a few basic easy readers available on Open Library, and now we're reading through a book from our own collection, Solids, Liquids, and Gases by Jeanne Bendick. This book ties in nicely with our first science lesson of the year, which is about sorting things into categories, and it also had some good connections to a book we read as a fun math review, Let's Find Out About Addition. Little Bo Peep (3 years) has been pretty resistant to doing much of any schoolwork, which is fine, since she doesn't really need a lot at this age. She has, however, become very attached to certain books. The one she likes most right now, and which I am asked to read over and over again, is All About Alfie by Shirley Hughes. This is a collection of four stories about preschooler Alfie and his baby sister Annie Rose, and Bo Peep just can't get enough of them. When she wakes up in the morning, she immediately looks for this book, and if she can't find it, she starts asking everyone to look for Alfie as though she has misplaced her best friend. When she's not carrying this book around the house, she is most likely paging through People by Peter Spier, the Little Miss books by Roger Hargreaves, the Beatrix Potter books (which she calls "Beaterix Potter"), and/or Weekend with Wendell by Kevin Henkes. I've been trying to read to her before naptime whenever I can, but there are still a lot of times where she would prefer to look at books alone. Bo Peep also recently heard Owl Moon for the first time, and her reaction did not disappoint. That book is truly magic. Jumping Joan (11 mos.) has started really liking to have books in her playpen with her. She has been enjoying What a Wonderful World illustrated by Tim Hopgood as well as our newly acquired board book copy of The Babies on the Bus, which my mom bought to replace the hardcover copy the two older girls destroyed with their intense love. Jumping Joan will happily sit on my lap and listen to almost any book, but she also really loves to turn pages, so there is a delicate balancing act between having her enjoy the book and repeatedly losing our page as she bats it out of my hands. Our first lunchtime read-aloud in the new house was The Galloping Goat and Other Stories, which was Phyllis Reynolds Naylor's first book. (I reviewed this book several years ago - it's worth owning.) It's a collection of short stories, each about a child living in a different country around the world. Miss Muffet loved the book, but Bo Peep only stayed to listen when she still had food on her plate. With Halloween around the corner, we're now reading Bunnicula, but Bo Peep is not all that into it so far. (Strangely, though, Jumping Joan smiled through the whole first chapter.) What Bo Peep did enjoy, though, is reading Stellaluna, which we did after I won an Instagram giveaway from Merry Makers Inc. and a stuffed Stellaluna turned up in our mailbox.